The network of leftist shareholder activism is complex and wide-ranging. In the name of progressive causes, they pressure companies to forfeit profitability, reduce investment returns, raise costs to customers and threaten both actual and potential jobs. It’s heartbreaking that religious shareholder groups not only willingly but passionately lend their support to secular causes promoted by US SIF: The Forum for Sustainable and Responsible Investment and Ceres. As I have noted previously, both organizations count religious shareholder groups among their respective membership rosters despite the harmful effects of US SIF and Ceres initiatives listed above. Both US SIF and Ceres are members of Green America, a nonprofit boasting its “mission is to harness economic power—the strength of consumers, investors, businesses, and the marketplace—to create a socially just and environmentally sustainable society.” Sigh. Last week, Green America blasted a fundraising email trumpeting the organization’s efforts against family friendly restaurant chains LongHorn Steakhouse and Olive Garden, which are both operated under parent company Darden. 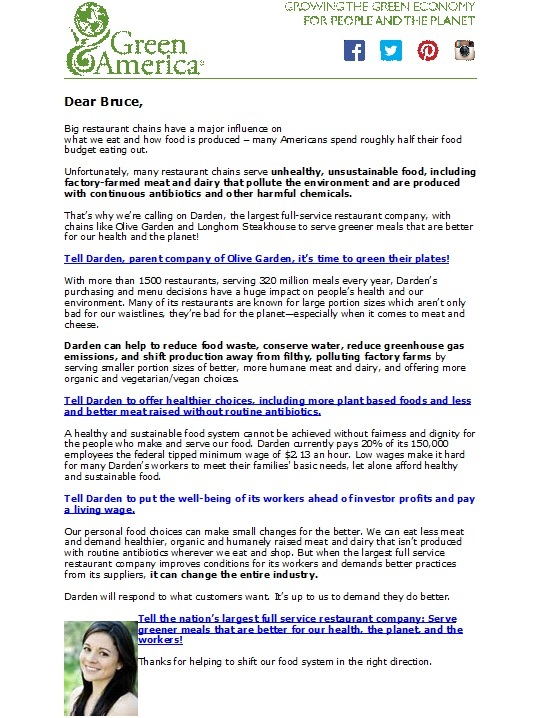 The entire email is below, but I’ll cut to the chase for those possessing little patience for the bossy boots desires of Green America’s Director of Consumer Advocacy Elizabeth O’Connell: Institute all sorts of expensive progressive “solutions” to perceived free-market problems, including raising employee salaries to a “livable wage;” reducing portion sizes in response to American obesity; and altering menus to include more organic and vegetarian selections. Did I mention Darden operates LongHorn Steakhouse? In other words, nothing more than one-size fits-all solutions that ignore profitability, economics, consumer choices and, in short, reality. Through their associations with US SIF and Ceres, such religious shareholder activists as As You Sow and the Interfaith Center on Corporate Responsibility actually help support such harmful nonsense. More’s the pity.